One should use necessary stuff. Do not keep too many ambitions. Ambitions give stress. Sometimes, extra income requires fulfilling responsibilities. If the mind line, as shown in the figure, divides in two parts then they might have two source of income. If both the lines are thick then they have two source of income. If one line is thin then there is one source. In this case, the second source of income would be unstable. 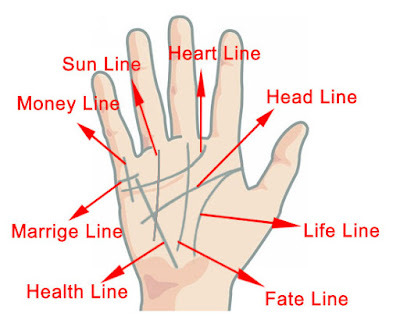 If Sun line, as shown in the figure, divides in two parts and they are clear then there are two source of income. If this line is thin then extra income would be unstable. If the line, as shown in the figure, starting from Mercury meets, without breaking, luck line then there are two source of income. The other sources of income will develop. 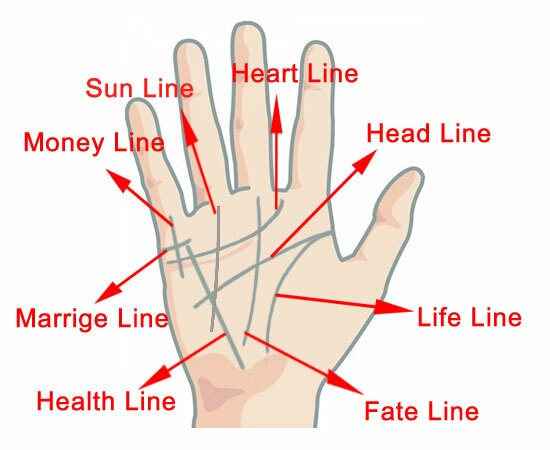 If Mercury line cuts luck line and moves forward then it closes both the sources of income and creates problem. If two lines, as shown in the figure, above the life line then one gets second source with the help of someone. The second source of income comes through grandfather, grandmother, father, mother or wife. Nowadays, many people have extra income lines in their hand. Extra income lines gives good result through hard work. One should does special remedies if there are no extra income lines. The source of extra income might be unstable. Every person has one special property. By improving this property one gets the source of extra income. Those whose Sun and Mars are good they earn good wealth through hard work. The regular worship of Sun and Hanuman gives power. Chant “Om Aem Hrim Klim Chamundaya Viche”. Daily chant “Hum Hanumant Rudratamkaye Hum Phat” before bed. One gets benefits in the span of 10 months after doing this remedy. Shri Yantra is extremely beneficial for extra income. Chanting Shri Shukat is beneficial for extra income. Chant this at night. The remedy of extra income should be done in necessary. Avoid doing this remedy for greed. By doing theses remedies, you will get rid off from your problems. Start chanting Shri Shukat from Navratri. Chant Shri Shukat more times till Diwali. One cannot save money even if he earns good money. This happens due to pitrudosha. Pitrudosha relates with house not with Karmkand. The source of income increases once you get rid of pitrudosha. Chant “Om Gram Grim Grom Saha Guruvye Namah”. Do such remedies for pitrudosha during pitru paksh. One should work hard when luck is weak.